This is a three stop multi-cache. Calculations at first stop will take you to the second one, which is a ½ litre Tupperware containing final coordinates. Either box shouldn't be too difficult to find - final cache is actually rather easy. If you're comfortable with mosquitos, you can have a picnic at final cache site. Total walking distance is between 3 and 4 kilometers (one way). The coordinates will take you in front of a large building. Bus 345 has its terminal point nearby. It might be wise to leave your car somewhere here. Let the number of white columns in front building entrace be A. Above the entrance there are two signs. Let the number of letters in the lower sign be B. Now look around. 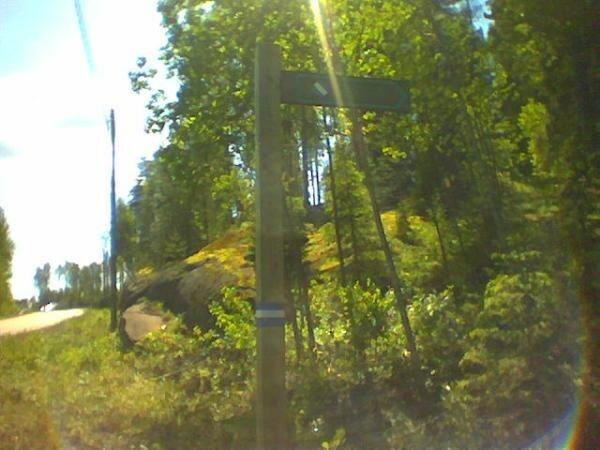 You'll find a signpole that has "Route 2000" as lower sign and above it a black&white sign with one word. Let the number of letters in that word be C. In attached picture you see how "Route 2000" sign looks like. Follow Route 2000 to the next stop to avoid trespassing. Blue and white stripes mark the route in forest. In the beginning route follows driveways. At N60°21,108' E24°38,798' they get separated. Round off the decimals and add an appropriate amount of zeros in front of the numbers where needed.